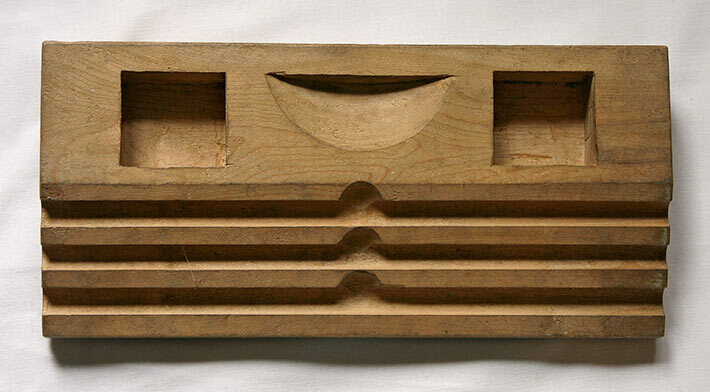 Wood stationary holder, unstained, made in Camp Petawawa, 1940-1942. The holder is constructed of one piece of wood. The are four feet adhered to the base.Three slots run the length of the base (10 inches). The holder also has two rectangular recesses and a semi-circular recess, probably for ink and such. The underside appears to have some water damage/spotting. This stationary holder is part of a group of wood objects collected and preserved by the family of internee Girolamo (George) Capponi. The stationary holder along with other wooden objects in the collection, may have been made by Capponi himself. He had written to his wife asking for wood-working tools.